Hello everyone! It feels like it’s getting longer and longer between posts! Basically, I’ve been struggling throughout February. Nothing feels like it’s gone my way and I’ve been at an all time low. Now, I’m feeling a bit more like me again (although I’m still feeling low) and I’m back at CBT tomorrow after 4 weeks off. I’m not really sure how it’s going to go. Time will tell! I said at the beginning of the year that I wanted to do monthly goals and then review them at the end of every month whilst setting new goals for the following month. So far, I’ve been pretty pants at achieving this! But I do have some goals that I want to achieve for March (and I’ve even got some for April already too!) 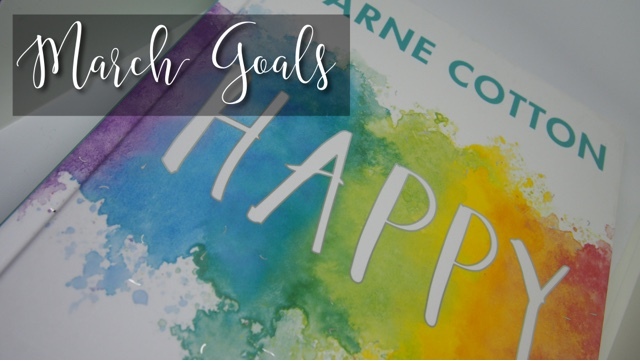 so there’s no better time to get cracking and list my goals for this month! Social Media | I’m going to make an assumption that every blogger/YouTuber has monthly goals relating to their social media following? Well, I have a few goals for March regarding my social media following! Twitter – reach 500 followers. I currently at around 340 followers so to hit 500 this month would be amazing! Instagram – reach 200 followers. I’m at 164 followers at the moment so not completely unachievable! Again, this would be amazing if I could reach this! YouTube – Start my channel & upload my first video! This is the one I’m most anxious about. I’ve thought about YouTube for years but my anxiety has always got in the way. I’m attending BlogCon this month, so I thought if I vlogged my day that would be a really good first video! Education & Work | Mainly on the education front but I have a couple of things I want to do this month! Start to learn a new language. I say this every year but never do it. So, I thought if I had it as a monthly goal I might actually start! Health | Soooo many things under this category! Let’s start with a few simple ones. Lose 5lb. This shouldn’t be too difficult as it’s just over 1lb a week to lose! Ditch the snacking habit. This is like smoking for me. I don’t smoke so my really bad habit is snacking. And I need to stop. Exercise! I currently do not exercise. At all. No, really. I don’t. But I want to start. Even if it’s Yoga or something not too strenuous to start with. Improve my mood. This is more to do with my mental health than general health. But I need to improve my mood. It’s just a downward spiral at the minute and I hate it. Fingers crossed! Phew! I’m sure that list was shorter in my head! I’ll hopefully keep you updated as the month goes on! How are your New Years Resolutions coming along?